Saint Dnyaneshwar was the second of the four children of Vithalpant and Rukminibai Kulkarni, a pious couple from the village Apegaon near Paithan (old Pratishthan) in Maharashtra on the banks of River Godavari. 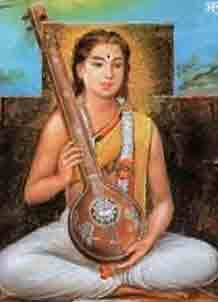 Vithalpant studied Vedas and Shastras and became well versed in them at a very young age. Being extremely pious and detached towards worldly matters he spent much of his time on pilgrimage. During one of the pilgrimages he visited Alandi about 30 Km from Pune and camped in the local Hanuman temple. Sidhopant, a local brahmin, was very much impressed with the youth and thought him as a suitable match for his daughter Rukmini. He met Vithalpant and after making enquiries proposed the marriage. Not having any interest in setting up a family, Vithalpant declined but because of instructions received in a vision he later consented. After marriage Vithalpant remained at Alandi for some time but due this lack of interest in family life his father-in-law took him to Apegaon where Vithalpants father Govindpant and mother were happy to see their married son. Unfortunately both passed away shortly thereafter leaving the family responsibilities to Vithalpant who could not make the two ends meet due to his disinterest in worldly matters. Finally Sidhopant took the couple back to Alandi under his shelter. But that did not make any difference to Vithalpant who one fine day went for bath on the river and instead of returning home, went to Varanasi. Vithalpant takes sanyas In Varanasi Vithalpant met a great saint Ramanandswami. Suppressing the fact that he was a married person he requested Ramanandswami to be accepted as a disciple and to be initiated as a sanyasi. Now, according to the rules, a married person cannot become a sanyasi unless he is permitted by his wife. The ritual of adopting the sanyas requires undergoing the rituals performed for a dead person. All his past is supposed to be erased and he is given a new name. Vithalpant was renamed as Chaitanyashram. One day Ramanandswami set upon a pilgrimage to Rameshwar and on the way halted at Alandi. While he was camping there Rukminibai who now spent her time in worship and other spiritual pre-occupations to drown her grief, went to meet Ramanndswami who uttered the words of blessing to her Putravati Bhava or “May you have children”. Rukminibai started laughing at these words and when asked to explain told the Swamiji the situation that her husband had deserted her. Swamiji probed her and realised that the description of her husband fitted his disciple Chaitanyashram. According to the shastras he was also to blame for having initiated Vithalpant. He immediately abandoned the pilgrimage and returned to Varanasi and accosted Chaitanyashram who confessed to his guilt. He ordered Chaitanyashram immediately to return to his wife and establish a family. Return of Vithalpant to family life Vithalpant returned to Alandi but was excommunicated from the community because it was unheard of and against shastras to abandon sanyas and adopt family life again. Vithalpant managed to spend his time in the study of Vedas and Shastras. In the course of time four children were borne to the couple: Nivrutti in the year 1273, Dnyandeo (Dnyaneshwar) in 1275, Sopan in 1277 and the fourth a daughter Muktabai in 1279. Everything was fine until Nivrutti was seven years old which is the time when a boy of brahmin parentage has to undergo thread ceremony and be inducted as a brahmin. He approached the brahmins of Alandi to be permitted to perform the thread ceremony but the conservative orthodox community refused. Nivrutti joins nath sect In a state of extreme distress Vithalpant went to Triambakeshwar (near Nasik) with his family for performing worship at the Shiva temple. Triambakeshwar is one of the twelve Jyotirlingas or luminary lingas of Lord Shiva. While they had gone for performing pradakshina (circumambulation) of the temple one night they encountered a ferocious tiger (in thirteenth century the area was a deep forest) The members of the family ran helter skelter and were dispersed. Nivrutti wandered into a cave in the Anjani mountain where Gahininath, one of the nine Naths was staying for some time. He was attracted towards Nivrutti and in spite of his young age initiated him into Nath sect assigning him the mantra “Ramakrishna Hari” instructing him to propagate devotion to Shri Krishna. That is how Nivrutti became Nivruttinath. The matter of excommunication did not affect this because the Nath sect does not bother about caste system and though socially it may be observed it is ignored in spiritual matters. Vithalpant and Rukminibai commit suicide All the four children were very intelligent and pious. They studied the Vedas and Shastras under their father but because they were excommunicated they could not join the brahmin community or study in schools run by them. In desperation Vithalpant went to Apegaon and appealed to the brahmins there who after studying the shastras opined that death was the only atonement for the sin. In a hopeless state of mind Vithalpant and Rukminibai abandoned their children at Apegaon, travelled to Prayag and drowned themselves in the River Ganges. The orphan children somehow grew up begging for dry alms from sympathetic people which they would cook and eat. In the course of time they too approached the brahmin community of Paithan to accept them as brahmins after whatever purification rites necessary but the brahmin community refused. However, considering the excellent behaviour of the children and their learning they permitted them to live in the community on the condition that they will observe celibacy and produce no progeny. This was in 1287 when Dnyandeo was twelve years old. Birth of Dnyaneshwari About this time Nivrutinath initiated Dnyanadeo into the Nath sect and instructed him to write a commentary on Gita. Thus we have a unique situation of a fourteen year old Guru instructing his twelve year old disciple to write something which has become the hope of humanity. The children moved to Nevase, a village in Nagar district on the banks of Pravara river. There Dnyandeo began his commentary on Gita. He used to give a discourse on it to a group of seekers, some of them belonging to the Nath sect but many were followers of the path of devotion. A local devotee by name Sacchinanandbaba wrote down whatever Dnyandeo said. A prominent person among the audience was the saint Namdeo known for the miracle where Vithoba the presiding deity of Pandharpur had eaten the food offering brought by Namdeo when he was a mere boy. Dnyandeo and Namdeo had met earlier at Pandharpur and developed mutual friendship. There is a legend regarding Sacchitanandababa mentioned above. On the day Nivrutiinath, Dnyandeo etc. entered Nevase, Sacchitanandababa had died and was being carried to the cremation ground accompanied by his wife Soudamini who wanted to commit Sati. Somebody suggested that a saint had come and she should get his blessings before going as Sati. She found Dnyandeo sitting in meditation under a tree. She bowed to him when he blessed her with the words “Akhand Saubhagyavati Bhava” meaning may you never be a widow. When he came out of meditation he realised the odd situation but praying to God and Guru and using his powers he brought back Sacchitanandababa to life. The latter remained his devotee for life. Dnyandeo started on his commentary which he called Bhavarthadeepika in the year 1287 when he was merely twelve year old. He finished it two and half years later in 1290. By that time he had developed a great friendship with Namdeo. He had also realised that the path of yoga on which the Nath sect gives a great stress could not be easily followed by everyone and the path of devotion was a key for all seekers irrespective of his or her caste, creed or gender. Perhaps he was influenced in this by Namdeo who was a tailor by profession and therefore traditionally belonged to Shudra caste. Dnyandeo joins Varkari group Shortly after the completion of Bhavarthadeepika, Dnyandeo joined the varkari movement probably under the influence of Namdeo and virtually became their leader. The varkari sect is known by that name because it is considered essential to visit Pandharpur at least twice a year, on the two Ekadashi (11th day by lunar calendar) in Ashadh (which falls sometime in August) and Kartik (which falls sometime in November) months. It is a path of devotion to Vithoba, the presiding deity of Pandharpur who is same as Shri Krishna. Peculiarity of this deity at Pandharpur is that it wears a crown with Shivalinga on it, thus linking the Shaivaites and Vaishnavaites. This deity used to be in Karnataka and was later brought to Pandharpur. For the sake of the devotees Dnyandeo wrote Amritanubhava, again in verse form dealing with spiritual and devotional topics. 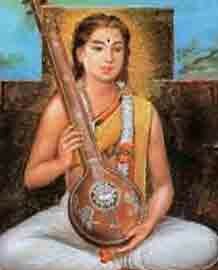 Both Dnyaneshwari and Amritanubhava are holy texts for the Varkari sect today. Pilgrimage and samadhi Dnyandeo then accompanied Namdeo and several other followers of devotee path like Savata Mali, began a pilgrimage of all the holy places of north, east and west India. Immediately after returning to Alandi Dnyandeo (in 1296) expressed his desire to leave his body by taking samadhi. 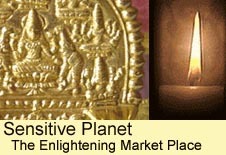 He chose the thirteenth day of the dark fortnight of Kartik for the final samadhi. People gathered and had final round of bhajans etc. Dnyandeo embraced his brothers and sister and close friends like Namdeo. With tears in the eyes of all he entered the cave and sat in the yogic posture, The cave was sealed by a stone and Dnyandeo left his body by yogic process. Dnyandeo was only 21 years of age at this time. Death of brothers and sister Within a year and a half of this event his brothers and sister also left the material world. Sopandeo took samadhi at Saswad near Pune. Nivruttinath travelled with his sister on a pilgrimage along Tapi river where both were caught one day in a thunderstorm. In the roar of thunder, rain and lightning Muktabai vanished without trace. Soon after, Nivruttinath took samadhi at Triambakeshwar. Thus was the end of an unusual family who enlightened the world spiritually and continue to do so even today. All the children were highly spiritually evolved persons. Muktabai, even as she was in her teens became Guru to a highly accomplished yogi named Changdeo who was believed to be several centuries old. Epilogue Soon after this the Muslim invasions India started in India and affected the religious and spiritual life of India, ending a spiritually golden era. It became progressively difficult to venture upon vari and pilgrimages. But copies of Dnyaneshwari were preserved by many families and were read regularly. In the course of copying and probably due to the additions of their own works, many copies got corrupted. Three hundred years later in 1584 Saint Eknath collected several available copies and after careful studies prepared a good copy as free of corrupt text as possible. Even today different copies available show slight differences in their contents as regards some words (and hence the meaning) and also the number of ovis. But that is not a very serious matter except to a historian. To read Jnaneswar’s Dnyaneshwari, please click here!